Fostering critical thinking abilities amongst students is seen as one component of preparing them to navigate uncertain and highly complex social lives and employment circumstances. In Criminology, critical thinking may best be conceptualised as drawing from critical theory to promote social justice and redress power inequities. Previous research suggests that graduates perceived the ability to think critically as a benefit of criminology degrees; however, it is less well established how discrete units of study contribute to the development of such an ability. This paper presents the findings of a study of students’ reported thinking development. Second and third year students, drawn from Arts, Social Sciences, Behavioural Sciences, and Law, who were completing a core unit of criminology were invited to participate. Participants wrote critical reflections on their thinking about crime and criminal justice, in terms of questioning taken-for granted assumptions, noting shifts in their positions on key issues of crime and justice, and developing their worldviews. Analysis of responses highlighted that certain topics were particularly salient to students, offering a way to engage them in deeper thinking. Students’ critical reflections showed evidence of personally relevant meaning-making, including the development of more nuanced thinking about crime and justice, and more compassionate rationales for aspiring to careers within the field. 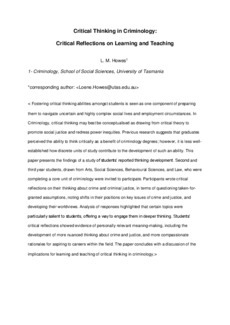 The paper concludes with a discussion of the implications for learning and teaching of critical thinking in criminology.